It is based at in the music department of the University of Huddersfield and currently coordinated by Pierre Alexandre Tremblay. It was made possible by the support of HEFCE's SRIF programme, and the University of Huddersfield's School of Music, Humanities, and Media. 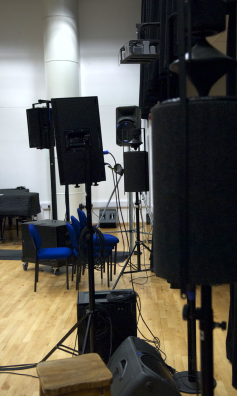 The Huddersfield Immersive Sound System was formed in September 2008 to cater for the needs of the expanding music technology praxis at the Music Department of the University of Huddersfield. The practice-based research team at Huddersfield brings a wide variety of approaches to contemporary electronic music, with particular focus the live and interactive elements. The HISS equipment was selected with a core arrangement that is suitable for any concert application, and a selection of more esoteric equipment for experimental sound projection and mixing, as well as the technical expertise to give each piece its ultimate concert rendering. Thus the HISS was born! The system has been used in very different settings, from pop gigs to mixed music performances, from multi-channel electroacoustic concert to sound installations. Since its birth, it has been the main sound system of the Electric Spring Festival, of the Huddersfield Contemporary Music Festival, postgrad student concerts like inclusive improv's WofS and Hud_Sound's re.sound series, as well as many departmental concerts of all kinds. The core team of the HISS is Prof. Pierre Alexandre Tremblay, Dr Alex Harker and Stewart Worthy, with significant contribution from most members of the CeReNeM, Prof. Monty Adkins, Prof. Michael Clarke, Dr Geoff Cox and Dr. Julio d'Escrivan leading the ball. 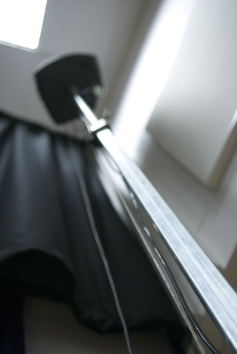 - Most composers and performers who have used the HISS have raved about it, but Professor Barry Truax's spontaneous exclamation that his music has never sound as good anywhere is quite something said about the quality of the system! - Most pictures on this website were taken by Scott Hewitt or Sam Freeman. 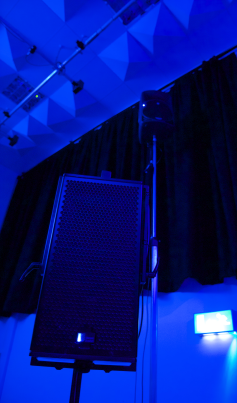 The HISS has been conceived as a flexible sound system for all electronic music, but with a focus on electroacoustic and mixed music, with the help of world-class P.A. designer Mario St-Onge. It is based around a flat-response full-range multichannel sound system, and flat-response microphones, all linked to a powerful matrix of a digital mixing desk and a computer, to allow pristine rendition of the sources, be it electronic or acoustic. The exploration of a new integrated approach to mixed music composition and performance, with the help of Scott McLaughlin, and other performers and composers to be announced. In other words, my research lab at the uni, with a major sound system dedicated to this music, and some publications. Funded by the HEFCE's SRIF and AHRC Practice-Led Research Scheme. HISSTools first release is a set of tools for working with convolution and impulse responses in the Max multimedia visual programming language. 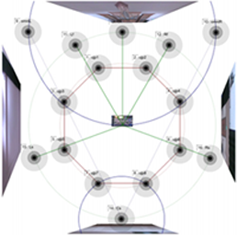 This set of objects addresses various tasks, including measuring impulse responses, spectral display from realtime data and buffers, and buffer-based convolution, deconvolution and inversion. The suite has been adopted by a multitude of communities, from creative music software designers to concert hall acousticians, from bespoke amplifier designers to experimental music producers. You can download the toolbox and its source code under Downloads -> Software, or you can read about the methodology behind the suite under Downloads -> Papers. You can also check two online tutorials about the suite: the first shows how to take impulse responses with the suite, the second is about impulse response inversion for room/loudspeaker correction. The first outcome was the HISSTools Impulse Response Toolbox. This H2020 ERC-funded project is in full action! Concerned with extending the musicianly approaches to cutting-edge technologies, its methodologies and results are openly available on the official FluCoMa website. Over the summer, Creative Coding Lab PhD researcher Oli Larkin will be using the HISS in a residency series with 8 composers and producers from different electronic music backgrounds. The visiting composers will work with Oliâ€™s prototype software instruments to realise a small musical sketch. Feedback from interviews about the process will inform the next iteration of his PhD research. Since its establishment, the HISS is a proud sponsor of the Electric Spring festival and Huddersfield Contemporary Music Festival (hcmf//). A multichannel audiovisual event with performances from Tadej Droljc, Core of the Coalman, Elliot J Buchanan and Cyanching. A concert part of the CeReNeM Visiting Artists-in-Residence. Five days of electronic music exploration. Performances by Philip Thomas, Colin Frank, Freida Abtan, Rodrigo Constanzo, Brian Crabtree, Angela Guyton, Sebastien Lavoie, and more. UK's premiere international festival of contemporary music. Various venues, University of Huddersfield. The Canadian composer performed his high-count loudspeaker music. Five days of electronic music exploration. Performances by David Toop, Minoru Sato, Sylvain Pohu, Hanna Hartman, Ambrose Field, Autistici, and the SOUNDKitchen collective. A gig by Hud_Sound in Phipps Hall at 18:30. Music by Hali Santamas, Phil Maguire, Ashley Green, Girilal Baas and Frédéric Dufeu. A concert from the research community of the Music Department. a videomusic concert featuring Andrew Lewis's music. Five days of Sonic Explorations, Creative Arts Building, University of Huddersfield. The world's biggest Computer Music Conference, hosted in various venues of the University of Huddersfield. Five days of Sonic Explorations featuring Pierre Alexandre Tremblay, Ricardo Climent, Sam Pluta, Anne Laberge, Alexander Schubert, and Peyee Chen, Creative Arts Building, University of Huddersfield. 4 Bose L1Mk2 were used to provide a 360 coverage for the soundscore of The Last Cuckoo, composed by Mark Bokowiec, and performed at the Lawrence Batley Theatre, Huddersfield - 21st to 23rd October and at the Wilde Theatre, SouthHill Park, Bracknell - 26th to 27th October. The Quadraphonic soundscore was performed live using Max/MSP and the unobtrusive form of the Bose L1's meant that the visual aesthetic of the Charles Cusick set was not compromised. As part of their experimental electronic concert for the Frome Festival, showcasing the talents of a number of Huddersfield-based composers, **radiosonic.ltd** utilised an eight-channel ring of Meyer UPJ-1Ps from the HISS to create their signature sound world for the audience of Christ Church in Frome. The University of Huddersfield's music department presented an evening of experimental and electronic music at the Holmfirth Picturedrome for an evening of the Holmfirth Film Festival. They took with them a HISS setup for video and surround sound playback, consisting of 5 Meyer UPJ-1Ps, 2 Meyer M1D-SUBs, supplied with sound from the HISS Mac Pro. a concert/installation event organized by Adam Jansch and Richard Glover. In particular, the four Bose L1-mk2 speakers were arranged in a line across one side opposite the hall's organ in order to create an intertwined sound field between the two. In a solo concert by pianist and Huddersfield researcher [=Sebastian Berweck= - featuring music by Terry Riley, James Saunders and Hans Tutschku - the HISS made up the sound system. This intricate setup saw an eight-channel ring of Meyer UPJ-1Ps and M1D-SUBs running through the Yamaha DM2000 desk. Monitoring, DPA microphones and other equipment was sourced from the HISS cache also. - Five works for sound projection on loudspeaker orchestra in Phipps Hall: HISS@10 #2 Works by Alex Harker, Michael Clarke, P.A. Tremblay, Aaron Cassidy and Susie Green. - Three works for multichannel sound system in the Atrium: HISS@10 #3 Works by Owen Green, Gerard Roma and Elias Merino. Five days of electronic music exploration. A special concert within the York Concert Season to celebrating the 10th anniversary of the HISS. A special concert within the City University Concert Season to celebrating the 10th anniversary of the HISS. Below is a subset of the publications linked directly to HISS practices and outcomes. For further reading, please consult this link. Tremblay, Pierre Alexandre and McLaughlin, Scott (2009) Thinking Inside the Box: A New Integrated Approach to Mixed Music Composition and Performance. In: Proceedings of the International Computer Music Conference (ICMC 2009), Montréal, Canada, August 16-21, 2009. International Computer Music Association, pp. 379-386. 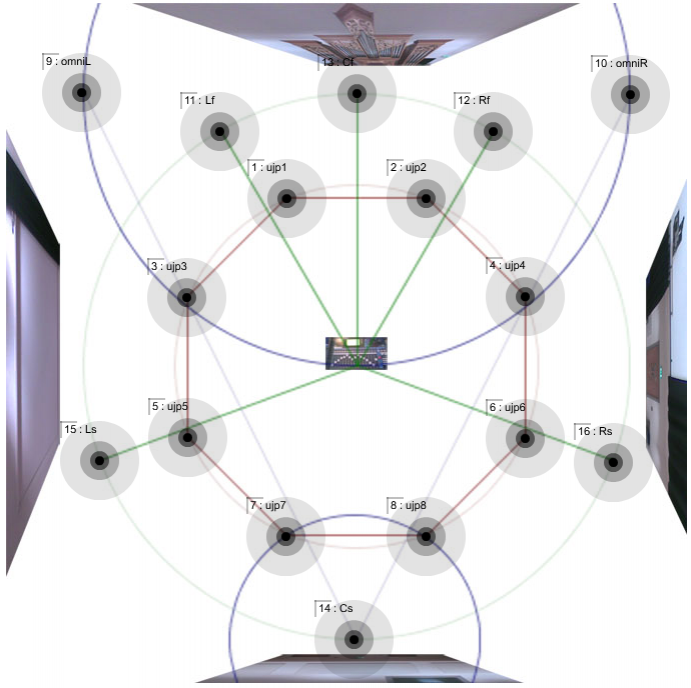 Tremblay, Pierre Alexandre and Schwarz, Diemo (2010) Surfing the Waves: Live Audio Mosaicing of an Electric Bass Performance as a Corpus Browsing Interface. In: Proceedings of the 2010 International Conference on New Interfaces for Musical Expression (NIME10), Sydney, Australia. NIME. Tremblay, Pierre Alexandre (2012) Considérations pragmatiques en musique mixtes: une approche systémique de l'inter-influence entre la composition, l'interprétation et la technique Symposium: Sixty years of mixed music, 22nd - 23rd November 2012, Paris, France. Harker, Alexander and Tremblay, Pierre Alexandre (2012) Rethinking the Box: Approaches to the Reality of Electronic Music Performance. 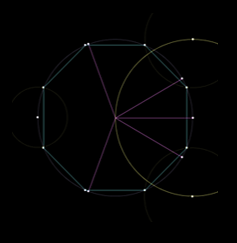 In: IRCAM Forum, 20-22 November 2013, IRCAM, Paris. HISSTools first release is a set of tools for working with convolution and impulse responses in MaxMSP. This set of object addresses various tasks, including measuring impulse responses, spectral display from realtime data/ buffers, and buffer-based convolution, deconvolution and inversion. Click the link above to dowwnload the paper, the source code and the externals!